Biology is the study of living organisms, including their structure, functioning, evolution, distribution and interrelationships whereas a Biological phenomenon is the series of chemical reactions or other events that result in a transformation. These are regulated by various means like gene expression, protein modification etc. Below is the list of some important biological phenomena which will be helpful for various entrances of the examinations. It is the process by which green plants prepare their own food by using sunlight, water and carbon dioxide. Plants get necessary nutrients to grow from photosynthesis. The energy from sunlight is trapped in plant cells by chloroplasts which are packed with chlorophyll which gives green colour to the plant and leaves. Incoming sunlight generates electric currents in them. These current converts ADP (adenosine diphosphate) in to ATP (adenosine triphosphate) and split water molecules in the cells in to oxygen and hydrogen. Thus oxygen is dissipated in to the atmosphere and hydrogen combines with carbon dioxide to form glucose, main fuel used by the living organisms. All biochemical reactions of processes taking place in the living organisms have two interwoven aspects i.e. Anabolism: When living organisms synthesise complex organic molecules from simple molecules. It is the constructive or synthetic phase of metabolism like the formation of proteins from amino acids. Catabolism: It is a process of breaking down complex organic molecules from simple molecules to release energy. For example breaking down of hydrocarbon in to simpler one releases energy. Metabolism takes place in a controlled manner at body temperature. In this process enzymes act as bio-catalysts. The energy that releases is stored and further used for growth and development. The process of the elimination of waste products is called excretion. This term comprises two distinct meanings i.e. breathing which is also known as external respiration and another one is internal respiration or cell respiration. Breathing is transportation of oxygen and carbon dioxide to and from the cells. Whereas internal respiration occurs within the cell and constitutes the chemical reaction from which the organism derives energy. Internal respiration using oxygen is termed as aerobic while anaerobic may occur in the absence of oxygen. We all know that both plants and animals respire. Animals need oxygen to release energy present in their food and get rid of waste i.e. carbon dioxide. Skin breathing: As name suggest it is carried out by the skin of slow-moving animals. Gill breathing: This respiration occurs in fish which have gills for breathing. Gills absorb oxygen from water through the mouth. Tracheal breathing: This type of breathing takes place in insects having network of tubes which take oxygen to all parts of the body. Lung breathing: Takes place in the animals. External fertilization: takes place in frogs, toads, fishes, most water creatures and lower plants like ferns. In an external fertilisation, the male gamete swims across a watery surface to fertilise the female gamete or egg. The fertilised egg cell is then able to develop in to an individual creature. Internal fertilization: takes place in mammals, birds, reptiles and insects. In this fertilization the sperms are shed directly in to the female’s body where they fertilize the egg before these are laid as in birds and reptiles whereas in mammals the cell develops in to an embryo within the female body. How fertilization takes place in flowering plants? Fertilization in higher plants is a complex process involving pollen grains which are transferred to the egg-bearing organism by wind or insects. This process is known as pollination. In this process pollen grains falls on the stigma of the plant. Then via pollen tube send it to the male reproductive cell down through the style in to the ovule where it fuses and develops in to an embryo plant. It is the evaporation of water from the stem and leaves of plants. It serves the purpose of cooling the leaves in summers and protects delicate leaf tissue from drying up. It also draws water up from the roots towards the leaves which give out excess water in to the atmosphere. 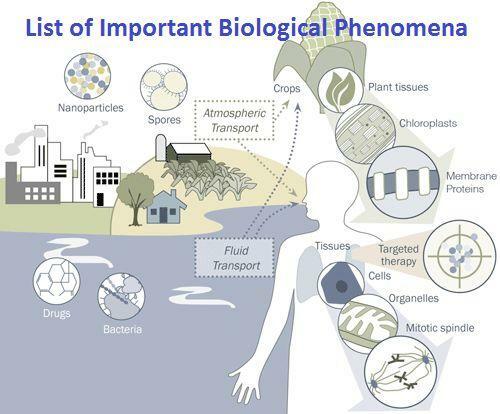 Through this article we come to know what is biological phenomena and important biological phenomena list.